JERUSALEM — A tiny religious sect is emerging as a major impediment for a controversial plan to connect modern Jerusalem and its historic Old City with a cable car network. Other objections — from Palestinian residents, environmentalists, urban planners and archaeologists — have so far been unable to halt the project. But the Karaite Jewish community's concern that the cable car will desecrate its ancient cemetery may provide the biggest hurdle of all to government planners. Israel's Tourism Ministry, along with Jerusalem city officials, proposed the cable car as a solution for ferrying tourists over traffic-snarled city streets and steep hills to the iconic walled Old City. The route would start near the "First Station," a renovated old railway station that's now a popular pedestrian mall, and soar over the biblical Valley of Hinnom, to Mount Zion and the outskirts of the Old City, 2 kilometers (1 mile) away. In Jerusalem, a city with over 3,000 years of history, virtually any development project can be contentious. New construction often grinds to a halt after an incidental discovery of antiquities and archaeologists are brought in to salvage ancient remains. After weighing various options for the cable car, planners chose the route as the most sensitive way to leave the city's historical treasures intact. But they apparently were unaware of the Karaite cemetery. "They're coming and trampling an entire community of 40,000 people and erasing them, not paying them heed," said Avi Yefet, a member of the Karaite community. Opposite Jerusalem's Old City walls, the grassy one-acre plot is still actively used by the Karaite community. Some tombs date back 2,000 years. Standing amid the wildflowers and lush grass surrounding the grave of his great-great-grandfather, once the head of Jerusalem's Karaite community, Yefet said he doubts the cable car plan will go through. He is all for modern development, he said — but not at the expense of his heritage. The Karaites emerged as a distinct community within Judaism in the early 9th century, interpreting the Hebrew Bible in a more literal fashion and rejecting rabbinic Jewish tradition codified in the Talmud, seen by most observant Jews as the main source of religious law. Consequently, their customs differ from mainstream Jewish practices: Judaism is passed down through the father, not the mother. They strictly adhere to laws of ritual purity and observe holidays according to sighting of the new moon. Today, Israel's Karaite community is based in Ramle, just outside of Tel Aviv, where their main synagogue is located. An estimated 500 families also live in Jerusalem, home to a medieval Karaite synagogue. Though they serve in the Israeli military and consider themselves Jewish in every respect, they face constant friction from Israel's rabbinic authorities when it comes to marriage, divorce and kosher slaughter. "Karaite Judaism preserves the oldest conception that most closely resembles the Second Temple era," said Shlomo Gaver, director of Israel's Universal Karaite Judaism organization. The Karaites said the Jerusalem Development Authority, one of the government organizations responsible for the Jerusalem cable car project, contacted them last August and proposed covering the cemetery in order to accommodate observant Jews who are "kohanim" — descendants of priests from the ancient temples in Jerusalem who cannot enter cemeteries out of concern for ritual purity. 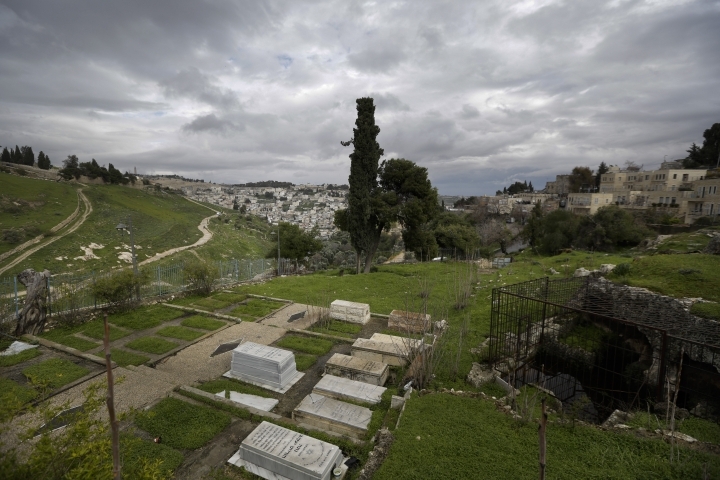 "According to Karaite religious law, any covering over a cemetery invalidates the cemetery," said Gaver. "Every member of the community feels personally insulted." "Nobody asked or was concerned whether it was a problem according to Karaite law if they were to build something over the cemetery," said Rom Golan, the Karaite community's attorney. "When we explained it was impossible according to religious law, we stopped hearing from them." The Tourism Ministry referred questions to the development authority, which said the planning process was conducted with transparency but that "unfortunately, the Karaite representatives chose to unilaterally stop the meetings." "We would be happy if they would choose to, once again, conduct a deep and thorough discussion of the possible solutions to their matter," it added, without saying whether the project will proceed. The government says the $55 million cable car project will make it easier for tourists to reach key religious and archaeological sites. The ministry submitted the plan to Israel's National Infrastructure Committee, and the public has until April 3 to present objections. The Karaites are just one of several groups opposed to the project. The planned route also passes through a national park and crosses from Jerusalem's western, Israeli side, into east Jerusalem. Israel captured east Jerusalem in the 1967 Mideast war and later annexed it, a move unrecognized by most of the international community. The Palestinians claim east Jerusalem as capital of a future state and view the cable car project as another move to permanently bind east Jerusalem to Israel. The planned route would also be built over the Palestinian neighborhood of Silwan. Critics — including archaeologists, architects, environmentalists, Palestinian Jerusalemites, and religious communities — contend the cable car will be an eyesore that will detract from Jerusalem's unique landscape and damage historic remains. The Israel Association of Architects and Urban Planners penned an open letter in October criticizing the utility, aesthetics and value of the project. "Nowhere in the world is there a precedent for something like this, in which a historic city hands over part of what is recognized as a historical and heritage site for a development of the kind proposed," the organization said. The Karaite community has called for an alternative route, saying the project would inflict "grave harm to the Jewish Karaites, the grounds of the cemetery, and the grieving families of the dead both past and future." For the Karaites, who say they face constant marginalization by Israel's Rabbinate, protecting their cemetery is another uphill battle. "We feel as though we always have to chase, chase, chase in order to realize our basic rights as citizens," said Gaver.